ESSENDON players were “disagreeing a lot” during Saturday’s 112-point demolition by Adelaide, Crows skipper Taylor Walker says. Walker says he’s saddened by the Bombers’ plight, having won just five games for the season and continuing to deal with the ongoing supplements saga. He says the team didn’t look to be united on the field, which the Crows “took advantage of”. “It’s very sad to see such a great club struggling at the moment,” Walker told Triple M Adelaide on Monday. “I don’t want to go into it too much, but they seemed to be disagreeing a lot on the field, and probably not playing for each other as you’d probably like. As the pressure intensifies on James Hird, Essendon great Tim Watson says the club should conclude its wide-ranging review before making a call on the coach. Watson, who has been consulted about the review, said Hird ultimately might know best whether he is still the right man for the role. 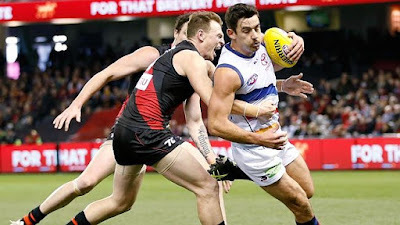 The 15th-placed Bombers have won only five matches this season, and two of their past 14, in which they have had an average losing margin of 51 points. Watson, the father of club captain Jobe, said the review, which will include a dissection of the football and recruiting departments, would consider many questions. "He [Hird] has had opportunities to stand down and he hasn't, but that has been about how the whole supplements program was viewed. This is about the actual performance of the team and he might be in a better position than anyone to decide whether or not it's about WADA, it's about the pressure the players are on or it's about his inability to be able to get the best out of the players," Watson said on Monday. "I would like to see the club complete its review before that decision is made. It's about everything. "If you have a review, you are talking about everything. Of course, central to the review to the way the team is performing is the role of the coach. Do the players believe in the coach's message? Do they understand the coach's message? Is he getting it through to the players? Do the players believe? "You might find from interviewing players that he has been so distracted by all the other parts to this that he hasn't been there and he hasn't been able to perform the main functions of his role. All that will be revealed after you interview players over a long period of time." Speaking on SEN, Watson said the supplements saga was still a major issue, regardless of who was coaching. "The WADA thing still hangs over their head. Whether you change the coach or not that is still there, and still a problem for everybody at the club," Watson said. "That's one of the major problems here. I think this official review into the club started a long time ago, because no one at the club is satisfied with where they are at on the field." The World Anti-Doping Agency's appeal to the Court of Arbitration for Sport will not be held until November. The Bombers have a monthly board meeting on Thursday, where Hird and the review are expected to be major agenda items. The club's powerful coterie, the Essendonians, has said it has empathy for Hird's predicament but has backed the review. If the Bombers were to move on Hird once the season was done, it's likely they would face a payout of about $700,000. They paid him more than $700,000 last season as part of his year-long AFL-imposed suspension.